1 of 5 Heat oven to 400 degrees F. Line baking sheet with aluminum foil. 2 of 5 Combine chili powder, black pepper, salt and ground red pepper in small bowl. 3 of 5 With sharp knife, separate wings at joint. Place pieces on waxed paper; sprinkle with spice mixture. Transfer to foil-lined baking sheet. 4 of 5 Bake in 400 degree F oven 40 to 45 minutes, turning every 15 minutes. With tongs, remove wings from oven and dip in sauce. Return to oven. 5 of 5 Bake in 400 degree F oven 10 minutes or until glazed. Place on serving platter. Garnish with celery leaves. Makes 24 pieces. 1 of 1 Wings can be prepared through step 4. Cover and refrigerate up to 2 days. 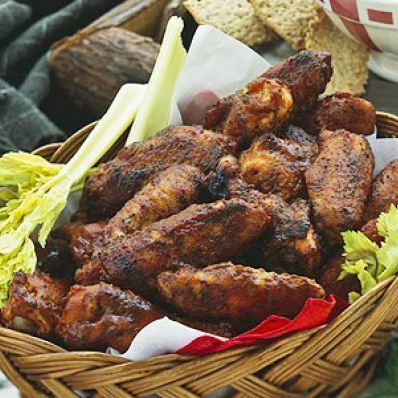 To serve, let wings stand at room temperature for 10 minutes. Dip in barbecue sauce. Bake at 400 degrees F for 20 minutes.